A winning dish begins with great quality ingredients which have been sourced with care. 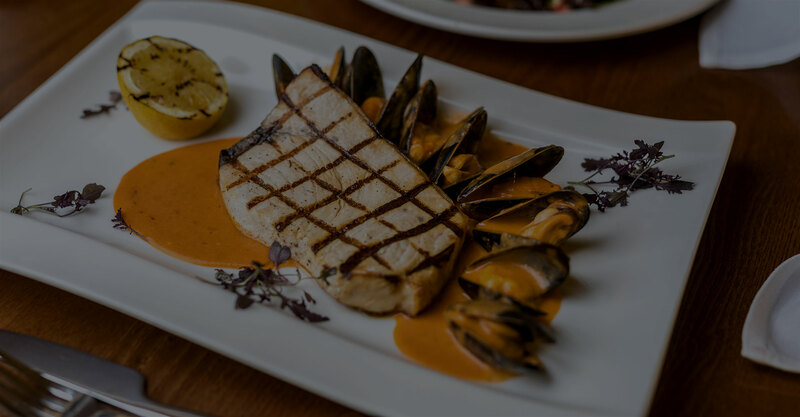 We get all our fish and vegetables fresh from the local market every day, and we proudly source our meat and poultry from the award-winning butchers, Owen Taylor & Sons. They are based locally in Derbyshire and supply us with the finest quality produce, locally sourced, wherever possible. Our light and tasty starters are a great way to whet your appetite before our delicious mains. Or alternatively, they’re great for diners with a smaller appetite or why not order a few starters and enjoy it tapas style? Lightly fried calamari, king prawns, scallops, sweet chilli sauce. Grilled goat cheese, bread croûton, spiced pear & honey glaze. Grilled Portobello mushroom, garlic butter, goats cheese, tomato sauce. King prawns, tomato, garlic, chilli & hint of cream. Smoked salmon, crab meat, prawns, mayonnaise & avocado. Parma ham, salame, mortadella, rocket, grissini, grana padano, olives. Italian cured beef fillet, rocket, parmesan shavings & lemon dressing. Chicken livers, shallots, marsala wine, cream, crispy pancetta. Aubergine, pecorino, tomato, basil & mozzarella. Baked spicy sausage, cannelini beans, fresh chilli, tomato & mozzarella. Buffalo mozzarella, beef tomato & basil oil. Gratinated king scallops, parmesan, parsley, garlic butter & shrimps. If there’s anyone who has mastered pasta and risotto, it’s us. These deliciously hearty dishes will give you your fill of quintessential Italian cuisine. Chicken breast, fresh spinach, cream & parmesan. White crab meat, sun blushed tomato, garlic, chilli & tomato. Spicy sausage, roast peppers, tomato sauce. Mixed seafood, tomato, garlic & parsley. Slow cooked beef ragu, tomato sauce. Spinach, courgettes, asparagus, butter & pecorino cheese sauce. Baked pasta sheets, mince beef, tomato & mozzarella. King prawns, mix seafood, garlic, lobster sauce. King prawns, scallops, courgettes, peas & saffron sauce. Full of flavour and texture, and finished in beautiful Italian dressings, our salads are far from ‘boring diet food’! Grilled chicken, crispy pancetta, mix leaves, beef tomatoes, red onion, Parmesan shavings & Caesar dressing. Crispy duck, pancetta, apple, rocket, balsamic glaze. Crab meat, smoked salmon, king prawns, beef tomatoes, red onion & Lemon dressing. Avocado, beef tomato, buffalo mozzarella, mix leaves, rocket & basil dressing. You’ll find more than just lamb, beef and chicken in our meaty dishes. Don’t be afraid to delve into our amazing Italian duck and veal delights! All of our meat and poultry is sourced from the award-winning butchers, Owen Taylor & Sons. They are based locally in Derbyshire and supply us with the finest quality produce, locally sourced, wherever possible. Breaded fried chicken breast, tomato, mozzarella, rocket & cherry tomatoes. Chicken breast, asparagus, cream & mushrooms. Pan fried chicken, spicy sausage, peppers, onions, garlic & tomato. Lamb shank, rosemary, tomato & red wine sauce, mash potato. Rack of lamb, honey glazed apples, marsala wine sauce. Fillet steak, bread crouton, duck pate & Madeira wine sauce. Pan fried veal, porcini & oyster mushrooms, cream sauce. Crispy duck legs, sweet Marsala wine & honey glazed apples. Sliced beef fillet, capers, shallots, anchovies, olive oil, balsamic vinegar. Served with house salad, chunky chips and a choice of sauce. Served with house salad, chunky chips and a choice of sauce. Sauces: Peppercorn, Bernaise, Blue cheese or Garlic butter. You’ll find nothing but proper, Italian pizza’s here. All our pizzas are made to order so if you can’t find your favourite topping here, feel free to ask and we’ll make you your own pizza. Buffalo mozzarella, tomato sauce & basil. Mixed vegetables, tomato sauce, pecorino cheese, mozzarella & fresh rocket. Spicy sausage, red onion, tomato sauce, mozzarella & fresh chilli. Mushrooms, artichokes, ham, olives, mozzarella, tomato sauce. Chicken, baby prawns, cherry tomatoes, mozzarella, fresh rocket. Freshly cooked fish dishes are a staple in restaurants across Italy. And it’s no different here at Cucina Rustica. Ask for our Special Menu where you’ll find a variety of fresh fish perfectly cooked by our Head Chef, daily!